Will Fallin Govern From Center? It’s way too early to call, but for progressives there are reasons to be hopeful that Gov. 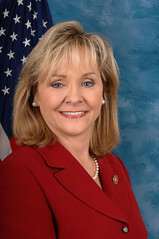 Mary Fallin is going to govern from a center-right position, distancing herself from right-wing extremism in the state GOP.
. . . I’m continuing to offer my full support to programs like “Women in Recovery” and other initiatives that address substance abuse, prevent incarceration, and allow more families to stay together. By fighting the hold that substance abuse has on our communities, we can make Oklahoma healthier and safer while working towards reducing our incarceration rates. With the right tools, our children will be the business leaders, the entrepreneurs, the social workers, and the teachers of the future. They will be our innovators and our civic leaders. I’m not trying to take her comments out of context because she did outline a GOP-type fiscal vision in her speech, but “reducing our incarceration rates” and at least indirectly encouraging young people to become social workers and teachers is hardly the stuff out of a Tea-Party manifesto. (3) Fallin also recently issued a press release indicating the state would accept $54.6 million from the federal government to help create a health exchange in the state. The money was made available because of the Affordable Care Act, which she adamantly opposed as “ObamaCare” during her campaign. The move was seen by some, including myself, as hypocritical, but it means she’s putting the health of the state’s residents above the political sloganeering that goes into a campaign. That’s a good sign. (4) Another factor that could be driving Fallin more to the center is the state corporate media’s editorial opposition to some of the most ideological legislation presented this session, including anti-illegal immigration and religious-inspired bills. As anyone who follows closely knows, the Oklahoma Legislature tends to do a lot of its business on the last two or three days of a session and then the governor is faced with a slew of bills to sign or not sign. Also, Fallin could always cave to right-wing extremists because she’s worried about a potential voter backlash, but she doesn’t run again-if she so chooses-until 2014. If she’s going to veto GOP-backed bills, this is the year for her to do so.